Excerpt from U.S. Coast Guard “Proceedings of the Marine Safety & Security Council” magazine. To read Part I, please see our Nov. 3 post. Lessons learned from marine casualty reports are regularly featured in Proceedings of the Marine Safety & Security Council magazine. These articles explore marine incidents and the causal factors, outline the subsequent casualty investigation, and describe the lessons learned as a result. Rooms A344 and A320: The two married couples in these rooms encountered a closed fire screen as they attempted to escape, and became separated. One wife assumed her husband had made it to safety when she heard a door slam shut ahead of her. Both wives escaped. Between 3:44 and 4:02 a.m., the engine fire party recovered the male passenger of room A320 in that alleyway. They pulled the semi-conscious man to safety, and he survived. Just 30 feet away, the party found the male of room A344. Though he, too, was quickly transported to safety, where a medical party quickly came to assist, they found he had stopped breathing, had no pulse, and could not be revived. Room A402: This married couple was able to escape their stateroom, but the elderly man suffered a respiratory arrest and collapsed on his way to their muster station. He was later recovered and taken to safety. Room A340: This couple was trapped in their room, unable to get through when calling 911. The fire party evacuated them. Of 2,690 passengers and the 1,123 crewmembers, there was one casualty. The autopsy of the man in room A344 reported his immediate cause of death was asphyxia, secondary to inhalation of smoke and irrespirable gases. Another 13 passengers and four crewmembers were treated for smoke inhalation. The cruise ship in this casualty seemed to be doing everything it should be. The ship was up to code and following the required regulations. Additionally, the crew’s quick and decisive actions prevented the situation from becoming worse. There was no evidence that accelerants were used to intentionally set the fire, and the only electrical fittings on the balcony were the enclosed light fittings above the balcony doors. The damage to the light fittings was consistent with exposure to an external heat source; there was no evidence of arcing or failure. The most likely source of ignition was a discarded cigarette. It was determined that the fire probably smoldered for about 20 minutes before flames developed. Although passengers aboard the cruise ship were instructed to properly extinguish cigarettes in ash trays during a safety video shown throughout the day on embarkation, as well as in stateroom safety literature, rules such as these are not always followed. After the fire, the International Council of Cruise Lines published a safety notice with recommended practices for balcony fire safety. IMO’s Maritime Safety Committee also initiated urgent measures to address cruise ship balcony fire safety, which were adopted just nine months after the fire. Under the new amendments, partitions separating balconies must be constructed of non-combustible materials. Furniture on cabin balconies must be of restricted fire risk unless fixed fire extinguishing systems, fixed fire detection, and fire alarm systems are fitted to the balconies. 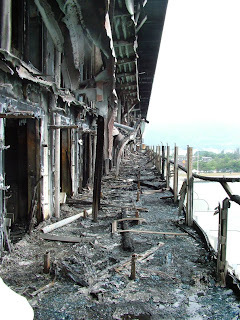 The photo shows polycarbonate balcony partitions, plastic furniture, and polyurethane deck tiles after the fire. These materials were highly combustible and produced very thick black smoke. In this case, not even the most experienced maritime organizations thought of every possible scenario, as evidenced by the lack of regulations regarding balcony materials. Perhaps this example will provide food for thought by prompting all vessel owners to evaluate whether all areas of their vessels are safe, what potential problems may arise, and whether the persons aboard are ready to respond to emergencies at all times. Full article is available at www.uscg.mil/proceedings. Click on “archives” and “2008 Volume 65, Number 2” (Summer 2008).